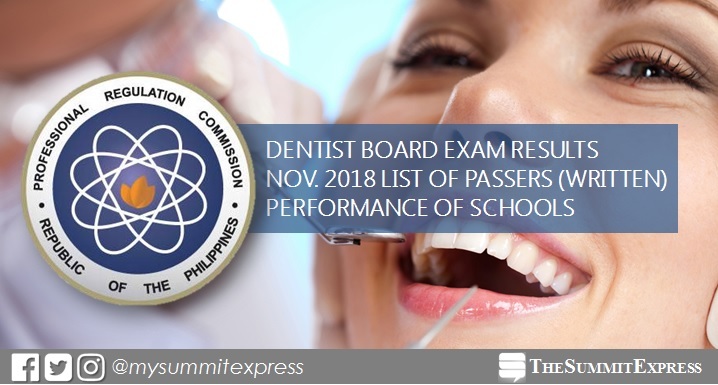 MANILA, Philippines – The November 2018 Dentist board exam results (Written Phase) including the complete list of passers, topnotchers (top 10), top performing schools and performance of schools are released by the Professional Regulation Commission (PRC) and the Board of Dentistry on Friday, December 28, 2018 or in two (2) working days after the last day of practical exam. View complete list of passers for practical phase here. PRC administered the Dentist board exam in Manila on November 28, 29 and 30 (Written board exam). Check out the performance of schools in the November 2018 Dentist Licensure Examination - Written Phase in alphabetical order as per R.A. 8981 otherwise known as PRC Modernization Act of 2000 Section 7(m) here. Dentist board written exam covered the following subjects: general and oral anatomy and physiology, general and oral pathology, general and oral microscopic anatomy and microbiology, restorative dentistry and public health and community dentistry, prosthethic dentistry, roentgenology, oral diagnosis and oral surgery and anesthesiology and pharmacology and pediatric dentistry and orthodontics, dental jurisprudence, ethics and practical management, periodontics and endodontics. Based from PRC resolution No. 2017-1068, the target release of November 2018 Dentist board exam results is on Wednesday, December 5, 2018 or in three (3) working days after the last day of exam. NOTE: The practical phase of the licensure exam is set on December 18, 19, 20 and 21, also in Manila. Target release of results is on December 28. In the same period last year, PRC announced results of Written Phase in just two (2) working days. A total of 762 out of 1,484 passed the exams.